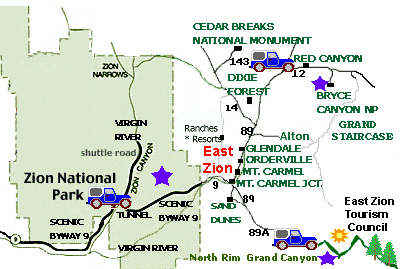 Zion Park is famous for its multi-colored sheer cliffs and monolithic sandstone walls which astound visitors. This Utah park is the on the edge of the Colorado Plateau, where the Great Basin and Mojave Desert meet. The top layer of Zion makes up the bottom layer of Bryce Canyon. The bottom layer of Zion is the top layer of the North Rim of the Grand Canyon. These three parks fit together to form the geologic structure: The Grand Staircase. Along the Canyon Country Tour you will be able to observe all five stair-steps. The visual imagery of this corner of Utah is amazing. 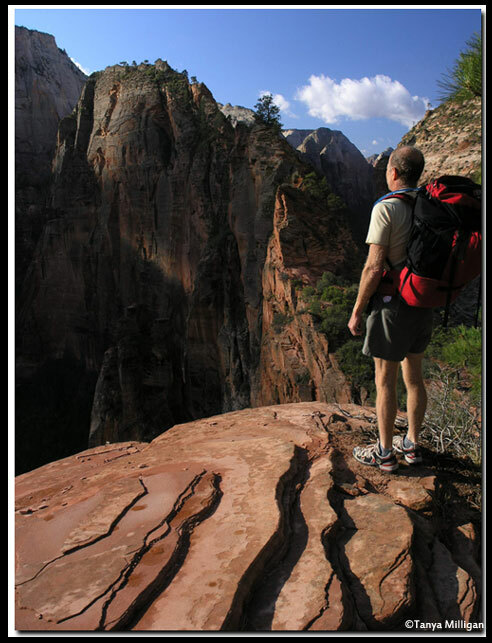 From the canyon floor to the impossibly tall cliffs and sandstone mesas, Zion is sure to please. Grand names such as Angels Landing, Great White Throne, Temple of Sinawava, Altar of Sacrifice, Court of the Patriarchs were given to landmarks long ago in an attempt to describe the areas magnificence. The East side of Zion is spectacular with its massive sandstone cliffs towering high above the mahogany graveled path of the Zion-Mt. Carmel Highway. Starting on the canyon side of the tunnel, the highway switchbacks up into slickrock country. The white beauty of the Beehives demand attention before the Great Arch steals it away. Heading through the Zion-Mt. Carmel Tunnel is an adventure in itself. When I was a child the park was not as popular and we were able to pull over in the tunnel and get out and spend time. Those days are long past now. The construction of this tunnel is considered to be a technological wonder of its time, the structure was completed when such a feat was thought impossible and on top of this, one of Zion's interpreters explained to me that the Switchbacks leading up to the tunnel was even more difficult to build. Immediately on the east side of the tunnel is a fun little trail called the Canyon Overlook Trail. This trail meanders along pretty scenery to an impressive view of the Switchbacks and Pine Creek. Continuing along the Zion-Mt. Carmel Hwy, hoodoos and a labyrinth of impressive monoliths edge toward the road. There are plenty of pull-outs along the twelve-miles from one end of the park to the other and there is certainly no lack of photo opportunities. At the east entrance of Zion, Checkerboard Mesa stands watch. This magnificent landmark impresses even the most critical visitor. The trailhead for the East Rim Trail, said to be "one of the best hikes in Utah," is found immediately past the park's east entrance. If you eat at the Zion Lodge you will see a photo of Menu Falls on the restaurant menu. This unique waterfall is found between the Weeping Rock shuttle stop and the Temple of Sinawava. This hidden waterfall has been used for weddings and is a secret area that few find. From the Weeping Rock parking lot, walk along the road toward Temple of Sinawava and you will see it on the right side of the road. Beneath Weeping Rock is a charming stream that tumbles over rocks as tadpoles and their older counter-parts swim and hop around. The stream is cool and refreshing on a hot summer day. Children will delight in watching the Canyon Tree Frogs and the tiny fish in the stream. Remember never to feed any of the wildlife in Zion. When hiking in Zion Park you will often hear a pleasing, but high pitched trill that vibrates through the air. The trilling chorus is a lively one in the spring and early summer during the Canyon Tree Frog's mating season. These little residents of the park have a light gray color that allows them to blend in with the rocks that are along many pools of water in Zion, which is their natural habitat. The small creatures can be difficult to spot but are common in Pine Creek and Hidden Canyon.